Prices are valid until further notice and include sales tax. Shipping fees shall be added to the product price. The products can be conveniently paid for via PayPal, by credit card, or prepaid by bank transfer. Photos are symbolic photos. Dietary supplements are not a substitute for a varied diet. A balanced diet and a healthy lifestyle are important. You want to help your worn joints to regenerate? You do sports and want to optimally care for your joints? You want to be mobile and active up until old age? You want to strengthen your joints and bones by helping your body to maintain them? Then you are one of those health-conscious people who Joint Fit by DDr. Heinrich® can help to improve their quality of life. Thanks to Joint Fit by DDr. Heinrich® you can support the maintenance of your joints – for a healthy, active, and vital life up until old age. Joint Fit by DDr. Heinrich® was developed by the Viennese doctor DDr. Karl-Georg Heinrich. With Joint Fit by DDr. Heinrich, DDr. Heinrich® places the highest demands on quality and effectiveness. Joint Fit by DDr. Heinrich® is rich in protein and contains a specially blended mix of amino acids, collagenous peptides, chondroitin sulfate, and hyaluronic acid – important building blocks of bones, cartilage, and joints. The application is simple: Joint Fit by DDr. Heinrich® is a powder ready to be mixed with a fluid of your preference. Mix 1 measuring spoonful once a day with a fluid such as soup, fruit juice, drinkable yoghurt, or milk, stir well, and drink. Joint Fit by DDr. 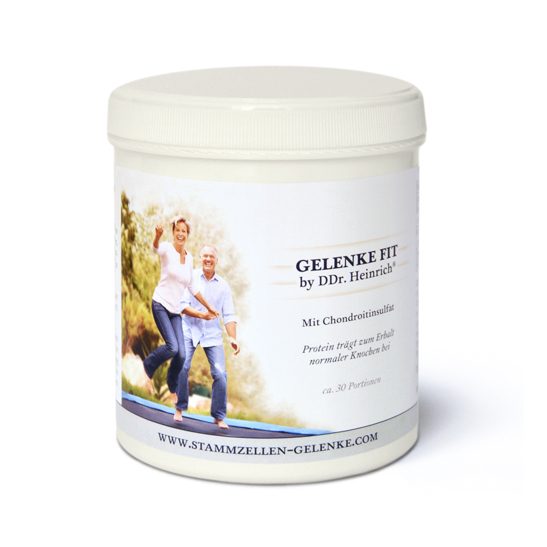 Heinrich® contains proteins, which contribute to the maintenance of normal bones. In case of joint problems such as pain or stiffness, it is advisable to have the cause clarified by a doctor. Depending on the specific joint ailment, such as osteoarthritis or sports injury, a joint treatment with stem cells from body fat might be considered.